Summary: There are still lots of questions around bank branch redesign. We help with some of the answers. 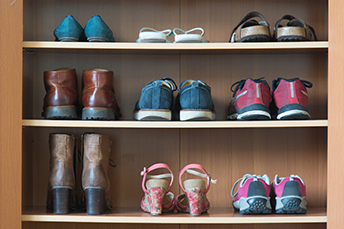 Shoes are big business when you consider sales in the US are expected to generate $83B in 2018. If you have shoe manufacturers or retailers as your customers, you will be happy to know this. Of course, shoes are designed for many tastes and styles, which happens to be the same for bank branch designs. Given all the advice swirling around about branch design, it's easy for a community banker to hit information overload. Are there in fact principles that bankers can use to guide good branch design? How much space do you need to devote to tellers vs. digital access? How much should the branch feel like a living room? When is a branch too big or too small? The answers to these and other questions about branch design often revolve around individual markets, as well as goals and needs. Take that last question about size. Is there such a thing as a branch that is too small? One bank that is pushing the envelope on branch size is PNC, which has converted a steel cargo container measuring a mere 160 square feet into a "tiny branch". Just to give you context - that's about the space of an apartment kitchen. This mini-branch has ATMs but no tellers, although employees are on hand to greet people and help open new accounts. This mobile branch parks in a busy location for short periods and then moves on to a new one. This type of mobile branch may not be a solution for very many banks, but it has proven useful to PNC in gaining new accounts in underserved locations. That is ultimately what effective branch design should do - serve the needs of both the bank and its customer base. Teller Time: Among the key questions to answer is how much teller time the branch will handle. If a branch handles fewer than 5,000 transactions a month, chances are tellers have long idle periods. In those cases, a branch might be better designed with fewer teller windows or perhaps none at all. Instead, the bank might opt to invest in video tellers and ATMs, while staffing the site with universal bankers who can do a variety of tasks. Customer Priorities: Meeting rooms and living-room-like waiting areas where customers can relax can be important perhaps. However, maybe your customers simply want to take care of business efficiently and don't need extra space for lounging around. Creating an appropriate space for the priorities of your customers maximizes branch space and revenue. Design Features: In general, branch design development should take into account a welcoming public space, some high tech service delivery, and a certain level of personal service. Once those factors have been considered and planned for, color scheme should be discussed. The branch is a good place to incorporate the color scheme of the bank's brand, but be careful as some could be too bold in large quantities for customers. No matter how you design your branches, the ultimate test is the people. To get the best results, don't skimp on training, particularly if a branch intends to use universal bankers who need to have a much broader understanding of things. Bottom Line: When it comes to branches, one design won't work for every situation, nor does one size. Like shoes, a branch should be not just stylish, but also comfortable and useful. After all, water-proof hip boots might be perfect for fly fishing, but you wouldn't want to wander into the gym wearing them. A new survey by FS-ISAC shows only 8% of financial firm cybersecurity leaders report directly into the CEO. The organization notes that direct and unrestricted communication between cybersecurity and the CEO and board would enhance decision-making and increase transparency. UK bank HSBC Holdings said it may face penalties of as much as $1.5B related to multiple investigations that are currently underway in various parts of its businesses. JP Morgan's chief economist adjusted down Q1 projected GDP from 3.0% to 2.5%, as inflation skyrocketed to its biggest MoM increase since 2005 in Jan and retail sales numbers were soft. The chances of a March rate hike are now up to 80% and Goldman puts them at 95%. The expectation at this point from many pundits is now 4 rate hikes in 2018. ICBA reports Fed Boston research finds that the top 5 ways US consumers preferred to make payments in 2008 vs. 2016 were: debit card (30.1% in 2008 vs. 31.6% in 2016); cash (21.8% vs. 26.6%); credit card (20.9% vs. 21.1%); check (13.4% vs. 6.5%) and bank account number payments (8.0% vs. 5.0%).